The payment cart is setup for Paypal; however, Bitcoin is accepted. If BTC is your preferred route, send me an email and I'll send you the address. For BTC users, the shipping charge will be waived. If you are not currently a Bitcoin user but would like the shipping waived, the link below to the Coinbase exhange can be used to set up a Coinbase account, where you can buy, sell, send, and receive Bitcoin. Using the link, your Coinbase account will also be credited with $10 worth of Bitcoin for free once you have reached the $100 level. Welcome! Thank you for visiting. You'll find both full restoration kits, Parts-Plus restoration kits, and on-off switches for your Fisher Reeceiver here. You can order the kits here or email me and I can invoice you. I am not currently listing these on eBay (user l_metalbone), but may do so again in the future. 8. A 14-16-page detailed description (with photos) of how this kit was installed on another Fisher Receiver. Many Fisher receivers experience declined performance such as hums, low output, scratchy sounds, etc. In addition, the power supply in the old Fishers are notorious for weakening, which can result in the output tubes running hot. This kit provides a basic level of restoration that almost anyone that is mechanically and/or electronically inclined can accomplish. It provides replacement parts for the original selenium rectifier that is almost always weak, as well as replacement for the original the electrolytic and mylar capacitors in the power supply path, the amplifier path, the radio path, and the multiplex subchassis. If your Fisher receiver experiences any of the above symptoms, this kit can correct them. Naturally, not all Fisher problems can be corrected with this kit, but consider this kit the basic starting point in restoring your receiver to its old glory. If your receiver needs replacement capacitors for the voltage doubler caps in the power supply (after the basic restoration, replacement of these caps usually corrects remaining problems), I have a under the chassis replacements available (these are new electrolytics to be installed beneath the chassis and are not new can capacitors). The detailed installation documentation includes a list of the tools and other materials that were used for installation, as well as detailed photographs that clearly show what was done. The basic tools needed included a soldering iron, screw driver, movable lamp, wire cutters, long nose pliers, and tweezers. A magnifying glass and multi-meter were very helpful. The kit includes all name brand parts, including components made by Nichicon (Muse), Black Gate, Vishay (Sprague Atom), Orange Drop, and Xicon. This kit is not for those who do not know about proper safety procedures when working with electricity. If you are not sure about what you are doing, are not mechanically or electronically inclined, or cannot read and understand a schematic, you should have a professional do the restoration. 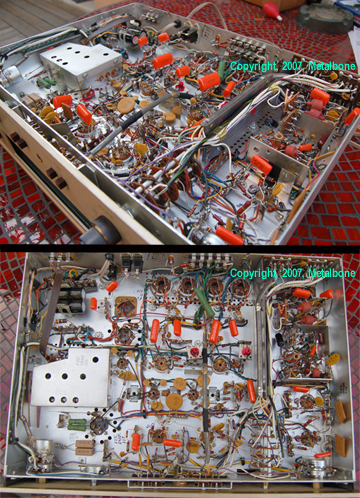 Also, working on Fisher receivers can be very dangerous, as is working on any electronic gear. If you do not know or understand basic electronic safety, or do not know how to prevent electrical shocks, you should not attempt to perform a restoration. Remember, you are solely responsible for your safety if you chose to restore your Fisher with this kit. I am selling each kit for $85 plus $9 shipping and handling (domestic). Please email me for international shipping rates. For the Fisher 400, there are two models, an Early Model with output tubes labeled V13-V16, and a Late Model with output tubes labeled V14-V17. 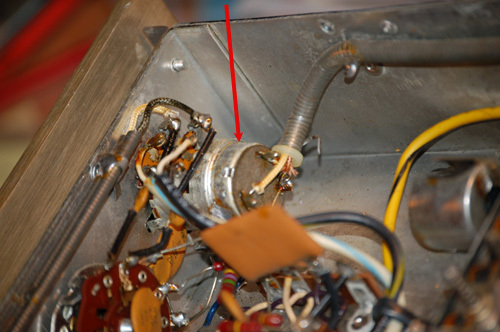 Please check your model before ordering your Model 400 restoration kit. If you already have a schematic, do not need the installation documentation, or are experienced, I am offering a Parts-Plus kit of the components only (Items 1-6 above, except the coupling capacitors are orange Drops instead of Sonicaps) for $60 plus $6 shipping (domestic). The Parts-Plus kits can also be upgraded to Sonicap coupling capacitors for an additional $15. Note: The Upgrade to Sonicaps option only applies to the Parts-Plus kit (the full kit already includes the Sonicaps). The Parts-Plus kits are available for the following Fisher receivers: 400 (early and late model), 500B, 500C, 800B, and 800C. I am offering my last 10 NOS replacement on/off switches for Fisher Receivers. These lock onto the back of the volume potentiometer of the Fisher 400, 500-B/C, and 800B/C. If I happen across some more, I'll offer them up again. If the switch in your unit works, you might want to consider installing an in-rush current limiter to dampen initial power surges then your unit is first turned on to preserve the life of the switch. All images and ad text on this page are protected under copyright laws and are not to be copied or duplicated without written permission.